This is an excerpt reprinted from Tablet Magazine. To read the full article, visit “The Mormons on Mount Scopus,” by Yair Rosenberg. Voices crying, thundering throughout our cities. Before the mountaintop opens wide to swallow you inside. Far from an anthem against encroaching Palestinians, the song is actually a call to arms against Mormons. It is a relic of the explosive debate that engulfed Israeli society over the construction of Brigham Young University’s Jerusalem campus, which marks its 27th anniversary this week. The incendiary affair brought thousands to protest in the streets of Jerusalem, precipitated a no-confidence motion in the Israeli government, and led hundreds of U.S. Congress members to intervene in the Jewish state’s internal politics. Today, with the campus long having faded into a benign fixture on the Jerusalem scene, it is hard to imagine the passions it once provoked. But as the anniversary approaches, it is worth recalling this tumultuous history, in recognition of how far Mormon-Jewish relations have come—and how far they have yet to go. It seems safe to say that when the Church of Jesus Christ of Latter-Day Saints decided to build a Jerusalem campus in 1979, it didn’t expect to provoke an intercontinental religious controversy. After all, Brigham Young University, the church’s Utah-based school, had been running semester-abroad programs in Israel since 1968 without incident, moving in and out of kibbutzim and Arab hotels. The program was led by a soft-spoken LDS scholar named David Galbraith, hardly the sort of person one would expect to find at the heart of a political firestorm. A Canadian native, Galbraith fell in love with Israel after spending time there on an ulpan Hebrew instruction program, where he also met his future wife, an overseas student from the Sorbonne. Galbraith then returned to Utah, finished BYU, and took a job with the Canadian defense department. “I was on the Far East desk, but my interest was the Middle East,” he recalled. He and his wife started their family in North America, but, he said, “we couldn’t get Israel out of our heads.” And so they departed for the holy land, where Galbraith pursued his PhD at Hebrew University in Middle Eastern studies and his wife completed her masters in Jewish studies. When BYU started sending students to Israel, Galbraith was a natural choice to oversee them. The program quickly grew from a pilot group of 30 students in 1968 to more than 100 in the years following. Soon BYU was looking to find them a permanent home with full academic facilities, from dorms to a library. For a while, it looked like the transition would be relatively painless. BYU and church officials toured potential sites and picked out one they wanted on Mount Scopus. 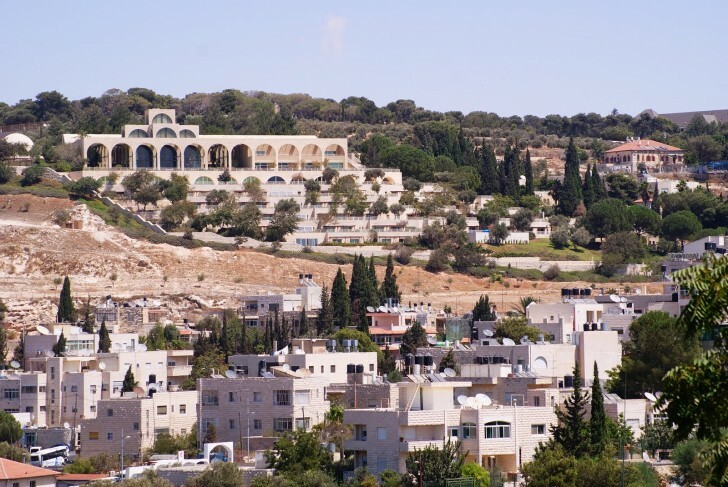 Though the area was initially closed to building, with the help of Jerusalem Mayor Teddy Kollek, they convinced the city planners to permit construction. Then, from October 1979 to April 1984, the project was approved at every level of government—including by the Jerusalem City Council and its ultra-Orthodox members, and by the ministers of education and interior, both members of the National Religious Party. Then the first bulldozer broke ground in 1984 and everything fell apart. As soon as the center became visible, it became controversial. Ultra-Orthodox activists in Jerusalem were horrified to discover that a non-Jewish religious group with a strong proselytizing ethos had been granted prime real estate in Judaism’s holiest city. What happened next spanned years and continents. It is recounted in historian Alan Casper’s unpublished BYU master’s thesis on the opposition to the LDS center, from which translations of several documents cited below are drawn. To begin with, the protesters rejected BYU’s official distinction between academic activity and missionary activity, arguing that the two were inextricably intertwined for the LDS Church. As evidence of the center’s “true” agenda, activists pointed to Mormon manuals for proselytizing to Jews—which were sometimes less than flattering in their portrayal of them—and brandished Hebrew and Yiddish translations of the Book of Mormon. Though Galbraith and church leaders had repeatedly assured Kollek that the center would be free from proselytizing, this did little to mollify their critics, many of whom had experience combating covert missionary activity by other Christian groups in Israel. And it wasn’t just ultra-Orthodox Jews in Jerusalem who sounded the alarm. A young U.S. Jewish leader named Malcolm Hoenlein—who would soon become the executive vice chairman of the Conference of Presidents of Major American Jewish Organizations—voiced ambivalence about the project, affirming the “right” of the LDS Church to build their campus while also expressing discomfort with the prospect. Nothing they do is selfless. Everything they do has the single goal of converting everyone they can. Pure and simple. The proposed BYU Center will provide access, not only to Israeli Jewry, but also (and especially) to large numbers of foreign, including American, Jewish youth who study in Jerusalem. … Until the Mormon Church … recognizes the legitimacy of Judaism for Israel, the Jewish people, they can want nothing other than to convert as many of us as they can get their hands on. These concerns among American Jews inevitably led to political action. In January 1986, New York’s Sen. Alfonse D’Amato and Rep. Benjamin Gilman wrote to Prime Minister Shimon Peres asking him to halt the center’s construction. A few months later, Rep. Stephen Solarz sent a letter to Israel’s ambassador expressing the concern of his constituents over “whether sufficient steps have been undertaken to avoid surreptitious missionary activities from operating out of the center.” These letters were promptly published in the Israeli press. At the same time, 154 congressmen—including Jewish lawmakers Mel Levine and Tom Lantos (whose wife and children were Mormons), as well as the chairmen of both the Democratic and Republican caucuses—signed a bipartisan missive urging the Israeli government to permit the center’s completion. Sen. Richard Lugar, chairman of the Senate Foreign Relations Committee, wrote personally to Peres on BYU’s behalf. Leaders of the Anti-Defamation League, B’nai Brith, and the modern Orthodox Yeshiva University also sided with the LDS Church. Meanwhile, back in Jerusalem, tensions were rising. In July 1985, the Mormon Center in the consular section of East Jerusalem was vandalized. Veiled death threats were made against Kollek, and pamphlets were distributed in ultra-Orthodox areas of Jerusalem likening him to Hitler and Haman. A program on army radio labeled the Mormons “enemies of Israel, a fifth column, a cancer in the body of the nation.” In the United States, multiple LDS churches and meeting centers received anonymous bomb threats warning them to “get out of Israel.” One congregation in Washington, D.C., received such a call while its 200 members were in the middle of worship. The incidents were swiftly condemned by the ADL and other Jewish leaders. Throughout the controversy, Galbraith received Hebrew phone calls threatening him and his family, some of which he played during an interview on Israeli radio, to the shock of many listeners. Finally, on Dec. 23, 1985, matters came to a head. The ultra-Orthodox Agudat Yisrael party put forward a no-confidence motion against the government on the issue—despite the fact that the party was a member of that government. The ensuing Knesset debate was raucous, and several ultra-Orthodox members were ejected during the proceedings. But though other religious parties registered their discontent with the center, fearing political retribution from inside the governing coalition, they did not ultimately support the motion, ensuring its failure. That August, however, Israel’s deputy attorney general ruled that there was no legal way to halt the construction at such a late stage, and the center’s opponents had to resign themselves to its completion. A week following the ruling, the cabinet unanimously approved the recommendation of the ministerial committee to allow the construction to proceed. The final nail in the coffin of the once formidable opposition came in May 1988, when the center was already open for students. Yair Rosenberg is a writer at Tablet and the editor of the English-language blog of the Israeli National Archives. Follow him on Twitter @Yair_Rosenberg. The article states that Abba Eban wrote “Authoritative Israeli statistics tell of four conversions of Jews to Mormonism.” I wonder if these statistics refer to four conversions world-wide or just in Israel? My Great, Great, Great Grandfather, Alexander Neibaur is considered the first Jew to join the LDS Church. He was baptized in Preston, England in 1838 and emigrated to Nauvoo where he did dental work for Joseph and Brigham. To their credit, it is amazing how strongly Church leaders “held their ground.” It would seem that the Lord was determined to bless us with a “house of learning” at the center of his mortal ministry. Thanks for this background information especially for those of us either not old enough to remember this time or not exposed to it. Please consider a follow up piece on how the BYU/Israel relationship has grown over the past 25+ years.